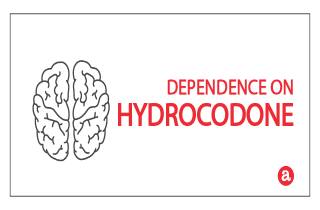 Hydrocodone dependence can develop as quickly as three (3) weeks after regular dosing begins. More here about dependence on hydrocodone and how it differs from addiction. Plus, a section for your questions about hydrocodone dependence at the end. Worried about developing a dependence on hydrocodone? You are not alone. Hydrocodone is very popular opiate used to treat moderate to severe pain. Hydrocodone is also blended with other substances to treat varies things. However, as a schedule III drug, hydrocodone has a potential for abuse and physical dependence. But does dependence mean that you could develop an hydrocodone addiction? How does hydrocodone affect the brain? And is hydrocodone addictive physically or mentally? In this article, we’ll explore the differences between dependence on hydrocodone and addiction. And we invite your questions about hydrocodone use or signs of hydrocodone addiction at the end. Dependence on hydrocodone is the physical need to take hydrocodone in order to feel normal. You can know if you’re dependent on hydrocodone by the presence or absence of withdrawal symptoms. This happens when you drastically lower hydrocodone doses or stop taking hydrocodone completely. If you experience hydrocodone withdrawal symptoms, this more than likely means you’ve become physically dependent on hydrocodone. What are symptoms of hydrocodone withdrawal? Imagine a really, really bad flu. Dependency on hydrocodone means you can’t stop taking hydrocodone without the presence of withdrawal symptoms. Addiction to hydrocodone is characterized by psychological dependence on hydrocodone and can include cravings, obsessive thoughts and/or compulsive drug seeking. How do you get addicted to hydrocodone? By using hydrocodone to get high, or to escape psychological or emotional pain. On the other hand, dependence to hydrocodone occurs when your body develops a need for hydrocodone in order for to behave and function normally. This type of physical dependence develops after normal, prescribed use of hydrocodone over extended periods of time or during abuse of hydrocodone to get high. However, when you start withdrawing from hydrocodone, symptoms of addiction might accompany dependency. It’s important to look out for drug seeking behavior or feeling like you need the drug in order to function properly. These are signs that you may be addicted to hydrocodone, rather than merely dependent on it. Hydrocodone dependence time: How long to be dependent on hydrocodone? Everyone reacts to hydrocodone differently, but you could develop hydrocodone dependency as quickly as a few weeks after continual use of hydrocodone. It may take other people more weeks for physical dependence to develop. And your level of tolerance to hydrocodone can also play a role how long it takes to become dependent. Because hydrocodone is classified as a schedule III narcotic by the Controlled Substances Act, it is important to take hydrocodone carefully. In fact, hydrocodone has a higher physical dependency rate than other medications. For the most part, different forms of hydrocodone are only used for short term pain-relief unless used specifically for certain pain disorders. Dependence on opioids like hydrocodone show up in a few ways. Some signs you should look for include taking hydrocodone to avoid withdrawal symptoms. Can I just stop taking hydrocodone? It depends on your dosing regime. So if you experience withdrawal symptoms when you stop taking hydrocodone, this is a sign of dependence. Also, if you have built up a tolerance to hydrocodone (needing more hydrocodone to achieve the same initial therapeutic effect), this can also point to physical dependence. But keep in mind that tolerance to hydrocodone is not a direct result of dependence to hydrocodone. The two conditions can occur at the same time, however. Do you still have questions about hydrocodone dependence and addiction? We invite you to leave us your questions about dependence on hydrocodone below. We welcome all questions and try to answer each one personally and promptly. I just started taking hydrocodone 5/325 about a 3 weeks ago, I’ve been taking 1 pill 3 times a day, typicaly at 9:pm, 3:am and 8:am. Sciatic pain from a buldging disc, ridiculous pain usually in the morning in my glute and down my right leg. Physical therapy at this point is not working but I’ve only had 3 appointments. My question is there any danger of addiction if I stick to the 3 times a day and don’t up the amount, also is there typically any health related issues I could have. I’m not too worried about addiction only because they take the pain away.. no euphoric feelings at least at this point. trying to ease off hydrocodone acetamin 10-325 post hip replacement 3 weeks ago. Went from one every 4 hrs in the beginning, now am taking one every seven hours. I am having a hard time with emotional issues: anxiety, depression, disturbingly bad thoughts. Of note, I started having these issues a couple of days post op, but they taperd off. now am having again after decreasing amount of hours in between doses slowly. Is it safe for me to just stop taking the hydrocodone? I feel like I can get by without it now except for PRN before physical therapy. Also, is it safe to use xanax to counteract the symptoms I discribed? Hi Amy. You might benefit from reading one of our ebooks, How to Quit Painkillers For Good. It sounds like you could be an unlucky person who has become addicted to painkillers after legitimate medical use. There are medications you can ask for during withdrawal….and a more humane tapering regimen. Perhaps your doctor can agree to a supervised taper? Sorry, I left something out,They were norco 5. I hate myself for starting this drug.I think it should be against the law for doctors to take you off drugs such as that cold turkey. I talk to the nurse about rehab,She told me,most people don’t go thur withdrawals.Now I know she’s lying. I haven’t had one in three days.I,m having them. I think about them when I try to relax. I started talking hydro;s 10 years ago.I had neck and shoulder spru,My doctor jacked me from,COLD TURKEY,I,m trying to get off them o my own..I think about finding some’ Than I stop to focus.I don’t know if I can do this. Hi, Iv been taking hydrocodone 10/325 for approx 10yrs (?) X 3 per day. This was after car accident with permanent damage to brain/spine/pain signaling = chronic pain, nerve,spine,muscle spasticity. Thru the years, espec in beginning, have tried many other pain meds. They helped at first, then I got bad hives & went into anaphlaxis shock. After that one frightening episode its like my body became hypersensitive & started rashing & reacting severely, and the opposite way they were supposed to. To everything! My body is still extremely sensitive to all meds. Recently went thru steroid psychosis which was misdignosed in ER as a panic attack. Sent home to “continue the prednisone for asthma, & calm down” That night I was ripping wallpaper out because ‘someone was back there!’ Severely suicidal, bugs in my hair. Awful thing to go thru alone. Ok, so, the Drs have only felt safe giving me hydrocodone as I didnt react crazy badly to it. Some itching and eye/ lip swelling, but not mood altering or crazy making. Never had any euphoria, except when Iv had enuf Miralax, and am able relieve constipation. Then damn right! Euphoric! Iv self monitored very closely, and been on same dose/schedule for close to 10 years. (Yup, 10yrs.) If I felt tolerance, or that it wasnt controlling pain as well, Id grit my teeth & spread the timing out, or cut in half to control it. Never the opposite, of taking more. Now the new rules are making it very difficult for me to get script filled, involving several trips out (each very painful for me) . Pharmacy frequently out. Involves sev trips out to go thru the process of filling this script. Each trip out very hard when Im in moderate to severe pain, which varies everyday. Cant count on being able to get out on any certain day. I literally cant do the back flips required to fill this script any more. I want to try getting off this myself, and try holistic approach. God help me, Im already afraid of the pain becoming uncontrollable, because this hydro only manages it. Here’s my questions…If I spread out timing to 8hrs I start feeling red hot burning skin sensation, and then icy cold, its severe. Like a very bad sunburn, very painful. Start migraining, which for me involves facial palsey, slurred speech etc. Diarhea, well, you know them all. I had hoped to just keep increasing the time between & deal with the burn, white knuckle through it but thats not going to teach my brain to accept a lower dose. I want to respect my poor body and do this right. Im thinking of just cutting them in half (they are scored so that means made to be able to cut right?) and take 1/2 × 3 per day. 4 if thats too quick. Deal with withdrawl symptoms from that, then? I dunno…cut into quarters? Or take 1/2 × 2 per day? Then 1/2 ×1? Which is a better taper? Want to do this at home myself if I can. Dont really trust Drs around here after so many insane drug reactions, and no help thru them, I trust myself more then them at this point. I figure my body will tell me how fast is too fast, but my brain needs a concrete respectful plan. Sorry I wrote so much, feels good to get it out though, so thanks for listening. So I had emergency surgery 07/28/2016 Arterial Cervical Disc Fusion C-2/C-7 I went for months to doctors , neurologist, heck at one time 2 weeks before my emergency surgery because my $320.00 a month insurance denied my MRI was sent to the nut house for a day. So now I had physical therapy, surgery and I’m good soso. I sit at a desk for work Allllllllll day on the phone and computer and my pain management doctor says go on disability or continue pain meds. I take a Hydrocodone 10/325 3x a day for a little over a year. I don’t take the 3rd one on the weekends since it doesn’t hurt then, BUT MY BIGGEST FEAR IS TO BECOME AN ADDICT! Hi. I started taking hydrocodone from a left over hip surgery in January 2017. I would take a 7.5/325 on Friday and then 3 or 4 on Saturday and again on Sunday. I loved the feeling it gave me. I was able to seize the world. I shortly after, maybe one month later, noticed I was getting depressed during the week days. I still have not totally convinced myself that the hydrocodone is the problem although Im close. I have still managed to take the same amounts but my depression has truly gone off the charts bad. Every Monday thru Thursday is the worst ever until the next one! I have been living for Friday so I can be picked up again. Problem is, my depression is close to doing me in. Does this sound like I am mentally withdrawing during the week due to the usage on the weekend? What is the best way to quit, cold turkey? PCP recently advised I discontinue use of 800 mg ibuprofen while we try to reduce my blood pressure, and substitute 325 hydrocodone to be used “as needed.” Recently due to severe sciatica related pains I have used 800 mg ibuprofen up to three times a day. I have used ibuprofen for sciatic paIn for over thirty years without negative effects. However, owing to the possibility of developing a dependence on hydrocodone I want better to understand the risks. At what general frequency of use of hydrocodone w/ acetominaphenover a period of time, say one month puts one at risk of developing a dependence? One to three times a day? One or none on some days; one or two on other days, or during stressful periods, say of three consecutive days using up to three doses of hydrocodone? My caution and hydrcodone side effects will urge me to use the drug minimally but I would appreciate some guidelines derived from other users experiences. Thanks very much. Hi Wayne. Developing hydrocodone dependence is different for each individual. The period varies from many factors such as person’s general health, dosage, frequency of use, metabolism, etc. I’ve been using opiates for more than five years. I have chronic back pain and was started off with hydrocodone 5 mg and gradually built up to as far as 50 m phentanale sorry now that’s not how you spell it but it’s an opiate used for treating cancer patients it’s a patch. I’ve just recently quite all uses of opiates and now have GI tract problems. My question is I was just hospitalized for over a week and can not recover my strength or equalibrium and was wondering is this a side effect of not having my opiate medicine. On the side while I was in the hospital I was given morphine to treat the pain for 3 days straight at regular intervals and again went through a mild withdrawal period and it’s been 2 weeks since I was in the hospital. Hi Brad. Withdrawal from Fentanyl can begin in the first 24 hours following cessation of use. While symptoms intensify about 72 hours after use, they usually resolve within 7-10 days. It was a good thing that you went to the hospital for monitoring. As for the GI tract symptoms, they are common with opiate withdrawal. Especially symptoms such as nausea, gastrointestinal cramping, diarrhea, etc. You can go to the local pharmacy and ask a pharmacist about some over-the-counter medications that can help you resolve these effects. I have been on Hydrocodone 10/325 for almost 5 years now after back surgery that left me with nerve and muscle damage, some muscle paralysis and other issues. I’ve come to the point where I feel I need more of the medication then I have ever taken. As soon as the meds wear off I feel withdraw effects with chills, excessive sweating, feeling nauseous, and some coinfusion. After I take a dosage I feel amaIzing, normal and energetic. I’m afraid I’m becoming addicted. What do I need do to?? Hi Paul. It’s actually tolerance and dependence to hydrocodone what you are experiencing. I wouldn’t say you are addicted. You see, when your body builds up tolerance to the medication, so after some time the med cannot produce the same effects as it used to. On the other hand, dependence is formed when the body gets so accustomed to the presence of the hydrocodone, so it craves it when it starts to get eliminated. You will need to lower doses gradually in order to decrease the levels of tolerance and dependence. Set up an appointment with your doctor to create a tapering schedule and give you advise on which meds can help you treat withdrawal symptoms. Hi Jan. How did the appointment with the doctor go? Are your doing well with detox and withdrawal symptoms? Feel free to write again if you need help with anything else. I hope you are feeling better and i wish you and your family happy Holidays. Do I stop taking hydrocodone before stopping the Clonazepam? Been taking hydrocodone (5/325) since 2009, low doses (no more than one a day, if that). I probably have Dependence on it versus Addiction as I tried to dose down then quit for two days (for back pain). I had 1/8 tab yesterday, and none the two days prior. I am soooo sleepy though esp. the last three days, could it be to lack of hydrocodone? I’m afraid to keep taking it as I want to get off Clonazepam also (1mg per night for sleep, sadly for the last 8 to 10 years). I have a doctor appt. this Thursday, I hope he knows what to do! Hi Anna. Tapering doses down is best. It will lower the intensity of the withdrawal symptoms and won’t be as stressful for your organism. You can see a doctor and talk about the best way to taper and what else you can do to ease the process. Somebody needs to regulate the pharmacy staff (Doctor wanna be’s) around the country about the hazards of having to sto abruptly without talking to the doctor…especially now that 10/325 hydrocodone has been rescheduled from C3 to C2. After being treated with it for 5 years, every month, they look at the rx and look at you in disdain and say…we’re out, we don’t have any, there are too many in this prescription, we’re not giving it to you (even though it’s the only place they went) or tell you to go to another pharmacy, which is out of many people’s pain contracts. they delight in watching people suffer with with withdrawals and violate their contracts if they find anyone who will fill it. CVS needs to quit playing doctor and do what they’re supposed to do. They need to be investigated for cruel and dangerous conduct in this new situation. I’ve been taking Norco for approximately one and a half years. I had foot surgery 4 months ago and my Norco prescription was a 10 mg. I never take more than 2 pills a day and my doctor recently lowered the dose to a 5 Norco. Is it safe to just quit taking Norco ..or should I taper off to none ? Hello Kay. Yes. Dependence on Lortab can occur after only a couple of weeks of daily dosing. Each person is different in terms of WHEN dependence occurs, but dependence is an expected outcome of taking Lortab daily over time. Can you develop dependence taking 7.5 loratab twice daily? Thanks!